I was thinking...: ...Stonnington Battle of the Bands is going to be awesome! ...Stonnington Battle of the Bands is going to be awesome! 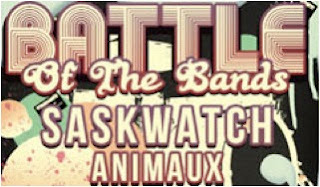 The Stonnington FReeZA Battle of the Bands heat is ready to go off this Friday night, July 6th, with bands Saskwatch and last year’s winner Animaux to headline the event. The all-ages event sees young bands Hot English, South East, Stereoking and Alice Blu battle it out for a place in the Victorian Battle of the Bands final as well as a $1000 recording and mastering package from Birdland Studios, Prahan and a spot on St Kilda Festival’s Push stage. The statewide winner wins the opportunity to play at Pushover festival 2013. The doors of the Malvern Town Hall, on the corner of High Street and Glenferrie Road, Malvern, open at 6pm. Tickets are $15 at the door or available for $10 on www.chapeloffchapel.com.au . For more information contact Soundslike Productions on 8290 7020. All FReeZA events are fully supervised and smoke, alcohol and drug free.